There comes a point at the end of every summer, when I yearn for the days to shorten and the nights to cool. Don’t get me wrong, I love summer, but there is something so comforting about layering on sweaters, hats, and eating SOUP! 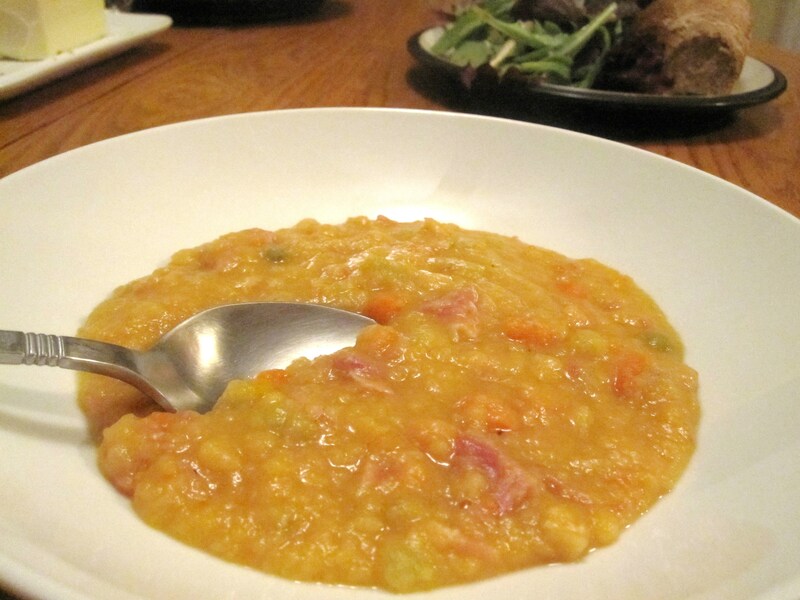 Now that we are a few months into frigid and rainy weather (ignore the minor fact that it is clear and 60 degrees here today), we must break out the big guns: a rich bowl of Split Pea Soup! This soup starts with a stock made from ham hocks and the old standby of onion, carrot, and celery. Once that cooks down for a few hours, you’ll have a flavorful base for the other simple ingredients. No time to make stock? Your soup will turn out great with water too! Just add the ham hocks to the soup with the water and peas. Looking for a vegetarian soup? Leave out the ham. You can use yellow or green split peas, either will taste fabulous. 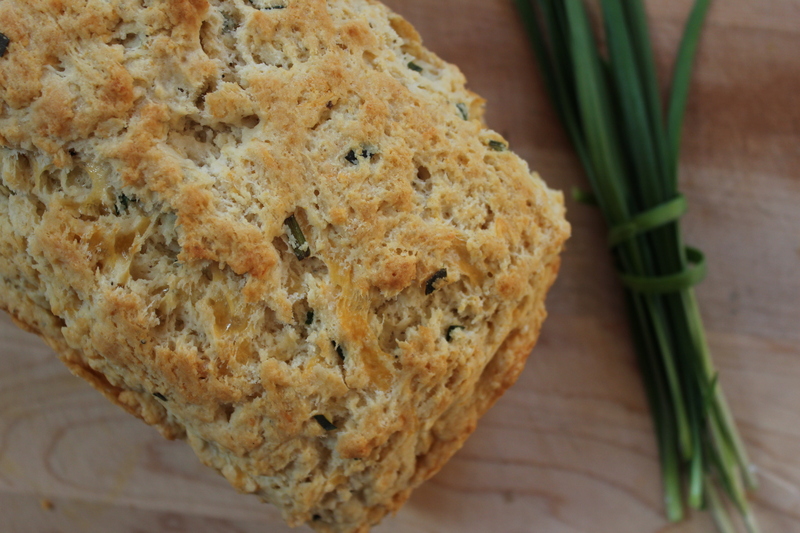 If you want to really make this meal memorable, be sure to bake the Beer Bread. This recipe comes from Sunset (via my mother). The bread is hearty, with a chewy bite and the perfect amount of tang from the beer. Both the soup and the bread freeze well. I find it best to freeze a family dinner portion of the soup and a loaf of bread for a busy weeknight down the road. Combine the above ingredients in a large pot. Add enough water to cover by 2 inches. Simmer for 3 hours partially covered. Add one teaspoon of salt after 1 hour. Strain out and discard the veggies. Reserve the stock and degrease. Reserve the ham hocks. Pull meat from the bone and chop into bite sized pieces. *This can be make ahead. Just refrigerate the stock for up to one week or freeze for later use. Melt butter in a large stock pot. 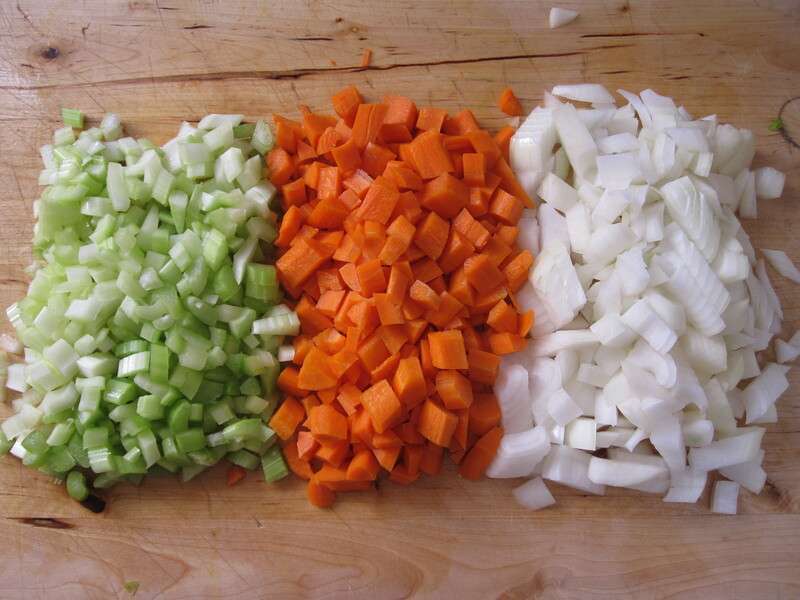 Saute onion, carrot, and celery until softened, but not browned. Add reserved ham (or whole hocks if you skipped the stock step), peas, bay leaves, and stock or water and bring to a boil. Reduce heat to medium low and partially cover pot. Cook until peas are soft and meat and veggies are tender. (Remove hocks and pull meat from the bone if not already done. Dice meat and return ham to soup.) Season to taste with salt and pepper. Serve warm with Beer Bread (recipe follows) and salad. Feel free to make this soup a day ahead. Refrigerate until cool, then cover. Pour beer into a small saucepan. Heat to steaming and remove from heat. Stir in next 4 ingredients. Set aside to cool. Combine, stir, and let stand 10 minutes. Combine cooled beer mixture and yeast mixture in bowl of your stand mixer or a large mixing bowl. Add wheat germ, wheat bran, and whole wheat flour. Mix until fully incorporated. Add unbleached flour, one cup at a time, kneading to incorporate fully before adding more. Stop after 2 cups and test the dough. It should be moist but not sticky. If it is still sticky, add flour cautiously, 1/2 cup at a time. Avoid adding too much flour, it can become very heavy and tough. 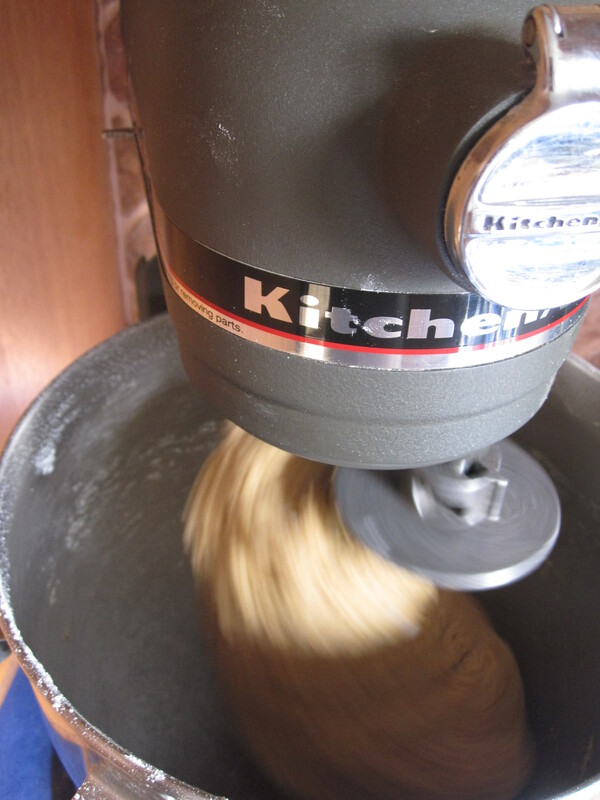 Knead dough for 10 minutes by hand or in mixer (less time- 5 minutes or so) until the dough is smooth and elastic. Place dough ball in an oiled bowl. Cover and allow to rise 1 hour. Punch down and let rise 45 minutes. Sprinkle 2 greased cooking sheet with cornmeal. Punch down dough, divide in half and form 2 8-inch rounds. Place on cornmeal-topped pans. Cover and let rise 40 minutes. Preheat oven to 375 degrees. Brush top with egg white mixed with 1 tablespoon of water (for a nice shiny crust). 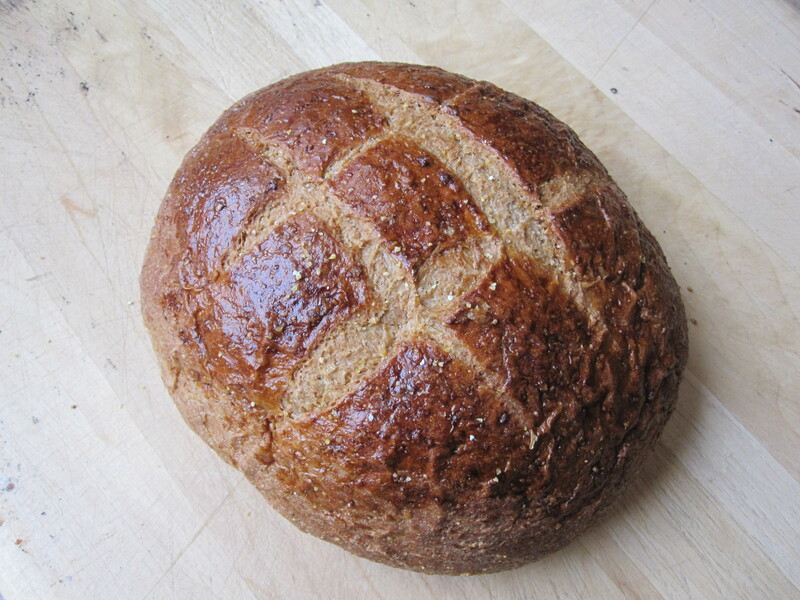 Use a sharp knife to cut a # shape on the top of the loaves. Bake for 40 minutes until bread is browned and sounds hollow when you knock on the bottom. Place on a cooling rack to cool. Serve with butter, Split Pea Soup, and salad. Yum!